Found all along the northern and eastern borderlines of the Northern Province, Mpumalanga and KwaZulu-Natal, with the inclusion of east Swaziland. In spite of efforts to re-bred the extinct Quagga out of the remaining two species of Zebra/Quagga, only the Buchell's zebra and the Cape mountain zebra survived the reckless slaughtering of the South African wildlife between 1820 and 1926, which saw both the Blue buck and the real Quagga disappear in extinction. The burchell's zebra, however, have survived in great numbers. This animal loves the open plains, the grasslands (savanna) and the warmer climate of the northern provinces. It lives for about 22 years. 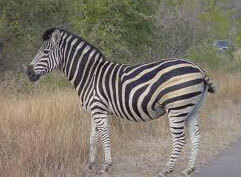 The zebra isn't an exclusive-living animal: it easily shares it's grazing with the blue wildebeest and other antelopes. The zebra, due to its high rating on a lion's menu, has learned to be very wary. In any dual between two males, or in any survival battle, the zebra can stand its ground fairly well with it's hammering hooves and strong teeth. The zebra may live in herds of hundreds, even thousands of wonderful contrasting black and white shaded‚ mule-like‚ figures. They have one of the most distinctly screams of the African wildlife scene, heard especially if danger struck one of the herd.